Improvements in cell lines, expression systems and genetic engineering, and culture media and additives have resulted in greatly improved titers in recent years, and the biopharmaceutical manufacturing industry has enjoyed substantial progress in upstream manufacturing. In fact, our industry data indicates that optimized cell culture processes represent one of the leading drivers of improved biomanufacturing performance. Optimizing media-related aspects of bioprocessing can have a considerable effect on performance, and as a result, the selection and improvement of culture media is a common approach taken by the industry to boost upstream productivity. 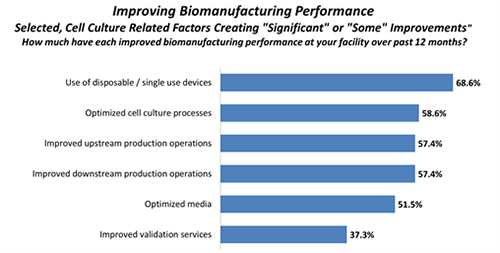 This is reflected in our biopharma industry survey data, which finds almost 6 in 10 (58.6%) of biomanufacturers reporting “significant” or “some” improvements in biomanufacturing performance over the past year due to optimized cell culture processes. Similarly, a majority (51.5%) reports such improvements due to optimized media. Methods used for optimization frequently include the use of various combinations of media formulations and process conditions that are tested in bioreactors. However, there are wide variances in how biomanufacturers approach bioprocess and media development and optimization. Some opt for the most basic approaches, adopting proven platforms and testing a few process conditions. Others apply more effort to custom process, design, and optimization, applying high-throughput screening in order to test larger numbers of variations. Furthermore, some concentrate on optimizing culture conditions at the expense of culture media, while others rely more on optimizing supplements without changing culture conditions or the basal media. 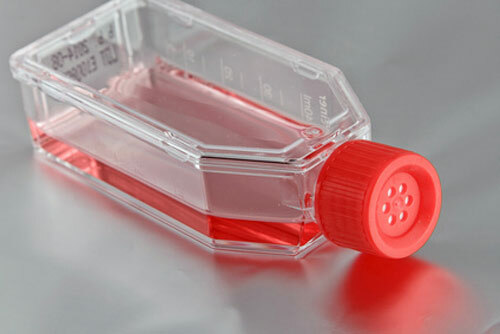 Although manufacturers are optimizing cell culture media processes with positive results, they continue to seek out new developments from the supplier side. 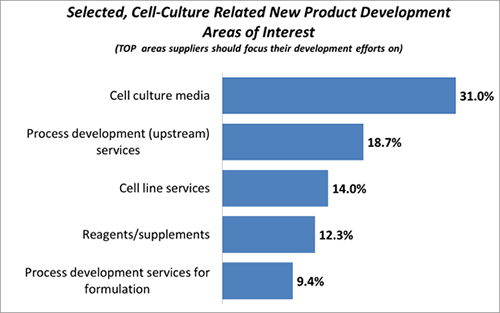 When we asked biomanufacturers to identify which of 21 areas they want their suppliers to focus their development efforts on, almost one-third (31%) chose cell culture media as one of their top three. That was the sixth-most cited area of interest, ahead of others including analytical development, downstream process development services, and fill finish services. It’s worth noting that the desire for cell culture media innovation is higher among biotherapeutic developers than among CMOs, who typically are on the leading edge of other types of new technology adoption. Likewise, optimized cell culture processes have resulted in performance improvements for a greater share of biotherapeutic developers than CMOs, though both groups seem to benefit relatively equally from optimized media. The reason for this is likely due to most large companies performing their media development in-house. As our research into this area has found, few large facilities and companies are outsourcing media development to CMOs, making this perhaps less of a focal point for CMOs. Indeed, only about one-tenth of media optimization activities are outsourced by facilities today, per our industry data, well behind more commonly outsourced areas such as fill/finish operations, analytical testing, and plant maintenance services. Our research shows that biotherapeutic developers are taking an active approach to optimizing cell culture media processes. This is a complex area for companies, and while some continue to rely on standardized and commercially available media, many have developed their own proprietary culture media. Sensitivity surrounding the sharing of this information may be a reason why this not a widely outsourced activity. Rather than optimizing media after the development of the design, it appears that companies are now finding it more desirable to combine media selection and optimization with bioprocess design. Culture media optimization services are in the top quartile of new areas they are working on. As such, it seems that biomanufacturers are positioned to enjoy more benefits from culture media optimization in the future. Eric S. Langer (elanger@bioplanassociates.com) is president and managing partner at BioPlan Associates. Website: www.bioplanassociates.com. The 2015 Twelfth Annual Report and Survey of Biopharmaceutical Manufacturing Capacity and Production yields a composite view and trend analysis from 237 responsible individuals at biopharmaceutical manufacturers and contract manufacturing organizations (CMOs) in 28 countries. The methodology also included 164 direct suppliers of materials, services and equipment to this industry. This year's study covers such issues as: new product needs, facility budget changes, current capacity, future capacity constraints, expansions, use of disposables, trends and budgets in disposables, trends in downstream purification, quality management and control, hiring issues, and employment. The quantitative trend analysis provides details and comparisons of production by biotherapeutic developers and CMOs. It also evaluates trends over time, and assesses differences in the world's major markets in the U.S. and Europe.